Francesca and Gill atop Mount Massive. With a business named Bad to the Bone Endurance Sports, sporting that World Wrestling Entertainment Inc. tagline, a couple calling Frisco home for three summers is staging a world championship U.S. debut that this year covers trail running from Breckenridge over to Minturn and ends up in Vail. Their event, the Ultra Race of Champions (UROC) 100K, serves as the Ultrarunning World Championship final for the international Sky Running Series, known as the 2013 Skyrunner World Ultra Final. And you thought the couple, Dr. Francesca and J. Russell Gill III, just ran off into the woods and mountain trails around here for the fun of it. They’re working — hard. When they’re not running, they’re having meetings with area town, resort and Forest Service officials to lock up their international-athlete-dominated event, which starts Saturday morning in Breckenridge. As business partners, running partners and life partners, Francesca and “Gill” (it’s easier) have been staying in Frisco’s Bear’s Den, working out of their rental condo and taking off to scout trails and keep their 41- and 48-year-old bodies, respectively, in shape. About the only slow thing Francesca does is walk their aging, barely seeing St. Bernard, Samson, around town. These ultra-marathoners have been running 20 years each, currently logging between 60 and 120 miles weekly, depending on the training season. Francesca ran the 2005 Badwater Ultra 135 — Death Valley to Mount Whitney — in 36 hours. Gill runs professionally for HOKA ONE ONE and Clif Bar. “A long-run training run can be all the way to 30-40 miles, or 50 if we use a race as a training run,” says Francesca, a native Italian who holds a doctorate in biology. Their company, based in Charlottesville, Va., has staged some 200 events in 12 years. Recently, they sold their retail store to concentrate more on the event production side. 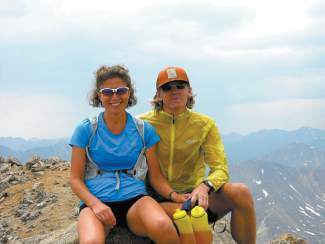 Come Saturday morning at 7, about 380 world-class ultra-distance runners will take off from Breckenridge’s Vertical Runner store (301 N. Main), owned by Ryan Morgan and Molly Mikita, head up Ski Hill Road and into the Tenmile Range, then come down to Frisco’s Historic Park at 8:15-10 a.m., before climbing back up and over the mountains to Copper’s Burning Stones Plaza. From there it’s back onto the mountainous trails to Minturn, then a turnaround with Vail as the target. The race covers 100 kilometers (63 miles) of running at extreme altitude. The event course will take an estimated nine and a half hours to cover, Francesca and Gill are thinking. UROC100k is attracting a field of competitors from the U.S., Spain, Italy, Norway, France, Brazil, Germany, England and Canada. Some of the big-time men’s names include world beater Kilian Jornet of Spain, Sage Candaday of Boulder, Max King of Oregon and Cameron Clayton of Boulder. On the distaff side, it will be Sweden’s Emelie Forsberg, Boulder’s Darcy Africa, Francesca Canepa of Italy, Leadville 100 winner Ashley Arnold and Eagle County’s Anita Ortiz. Here’s a partial lineup of running events Francesca and Gill stage: Miller Lite Charlottesville Marathon; Whole Foods Half-Marathon, 8K and Kids Mile; Über Rock 50K and Cruxy Half-Marathon; Charlottesville Fall Classic Half-Marathon and 10K; Real Girls Run Half-Marathon; Bel Monte 50-mile, 50K and 25K Endurance Runs; Danger!Zombies! Run! 5K; and the First Night Virginia 5K.